If I gave you the basic premise “four 70-ish-year-old guys spend a weekend in Vegas,” you could probably write a close approximation of what screenwriter Dan Fogelman actually did for Last Vegas. Because there’s virtually nothing to it beyond what’s indicated in that basic premise. Sure, Fogelman gives the quartet a backstory as childhood friends from Brooklyn, reunited for a bachelor party when longtime bachelor Billy (Michael Douglas) finally decides to tie the knot with his much-younger girlfriend. There’s some lingering animosity between Billy and Paddy (Robert De Niro) that bleeds over into their mutual interest in a lounge singer (Mary Steenburgen), and attempts by Archie (Morgan Freeman) and Sam (Kevin Kline) to smooth things over. But basically, it’s a comedy built on old men partying and dancing, and not knowing who 50 Cent is, and being in the proximity of bikini babes, because hilarity. The depressing thing is that there is the germ of something poignant in what these men are attempting to re-capture—the sense of invincibility they shared as adolescents—though it takes nearly the entire film for it to get there. Mostly, we get Sam turning into a wide-eyed horndog because his wife has given him a “freebie,” and erstwhile LMFAO-er Redfoo shaking his Speedo-clad junk in Paddy’s face. 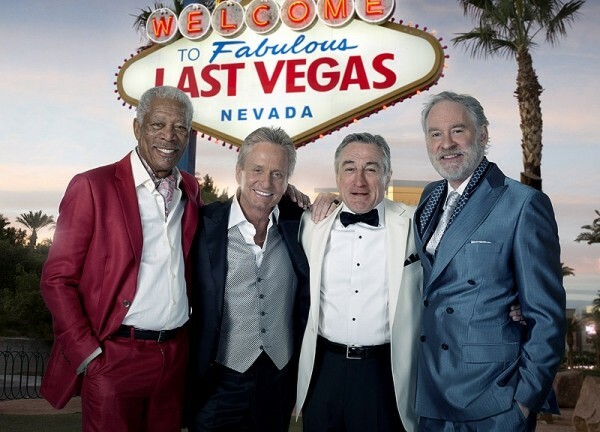 The result is something that undermines exactly what Last Vegas theoretically is trying to portray: the idea that men of a certain advanced age are still men, trying to figure out a way not to slip into invisibility or irrelevance on the way to death. The engaging performances by all of the key cast members can’t wash away the broad humor and episodic shenanigans. It makes it hard to believe the filmmakers really care all that much about giving these characters some much-needed dignity.